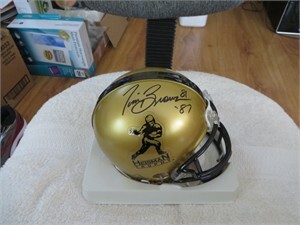 Gold Heisman Trophy logo Riddell mini helmet autographed in black marker by legendary Notre Dame receiver Tim Brown, and he added his number 81 and his Heisman year '87 to his signature. From a paid signing with AuthenticGraphs, with their matching numbered sticker on the helmet and certificate of authenticity. ONLY ONE AVAILABLE FOR SALE.